Freshman Bobby DiLorenzo was heading to Shake Shack for lunch with friends in October. As he attempted to cross the intersection of U.S. 1 and Ponce de Leon Boulevard, a Toyota Prius came careening around the corner, knocking him onto the windshield. Before any of the students got a good look at the driver, the vehicle sped off down the busy highway. While DiLorenzo walked away from the incident unharmed, other UM students have not been as fortunate. Since 1989, three students have been killed while crossing at this intersection. Five others have been critically injured. In response to this problem, UM’s administration, in collaboration with Student Government (SG), launched a campaign early last year calling for a pedestrian overpass across the intersection of U.S. 1 and Mariposa Court to prevent future accidents. The Miami-Dade County Commission approved the measure in a unanimous vote in July of 2013. Currently, however, more than six months after the approval of the overpass, the project is still in the planning phases. 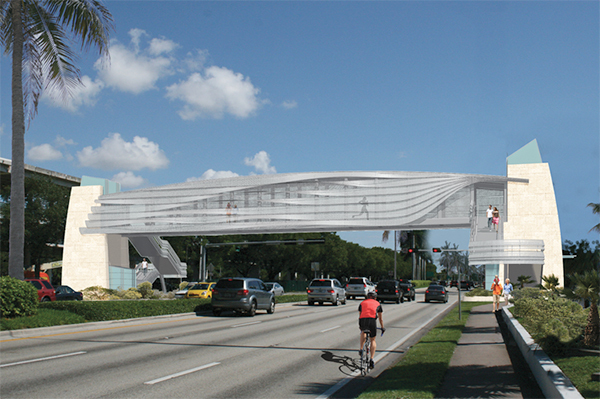 According to Miami-Dade Transit’s official timeline, construction of the overpass will not begin until March 2015. Plans to build an overpass have been in the works since 2003, but they have been halted repeatedly for various reasons, including budget issues. Miami-Dade County Commissioner Xavier Suarez, who represents District 7 – where UM is located – says the wait to start construction is too long. “I will not accept waiting a year for this overpass to be built,” said Suarez, who is also the sponsoring commissioner of this legislation. In a memo to Miami-Dade Transit Director Ysela Llort and Florida Department of Transportation Director Gus Pego, Commissioner Suarez called on government officials to “expedite, fast track, or do whatever it takes” to shorten the gap between completion of the overpass’s design and the beginning of its construction. “We cannot afford to have another serious accident in this important thoroughfare, which is traversed by thousands of students, teachers and staff,” Suarez said in the memo. SG President Bhumi Patel was active in the campaign for the overpass. She says the project that she helped to pass is now out of her hands. Despite frustrations, the project is not delayed. Irene Ferradaz, Miami-Dade Transit’s spokesperson, says the project is running right on schedule. According to Ferradaz, the design of the overpass will be completed by next month. The county must then obtain an aerial easement from the Florida Department of Transportation, granting permission to place the overpass over U.S. 1. In October, Miami-Dade County will begin accepting bids from contractors. It will take five months to evaluate bids and award a contract, Ferradaz said. In the meantime, Michael Colombo, a lieutenant in the UM Police Department, stresses that pedestrian safety is “absolutely” a major concern for university officials.